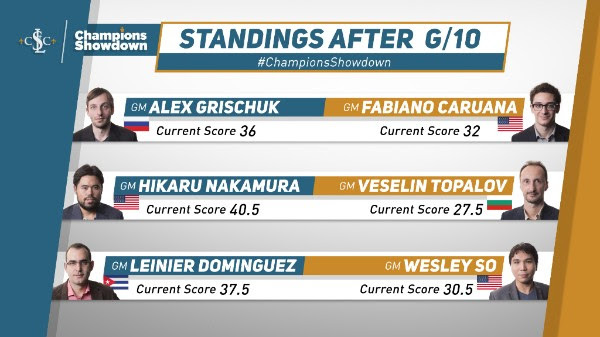 The third day of the Champions Showdown brought much more action to the fray. 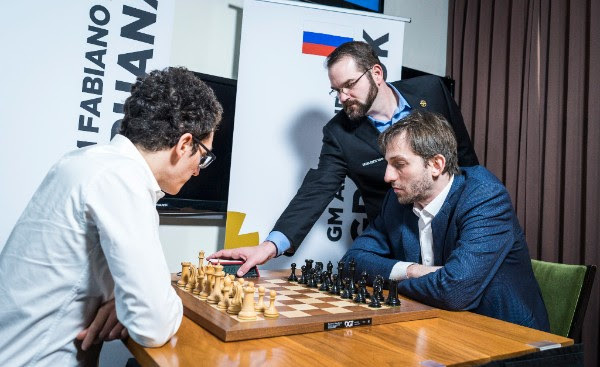 The three matches already in progress played eight games of g/10, an incredibly fast time control that saw both great brilliancies and fantastic blunders. 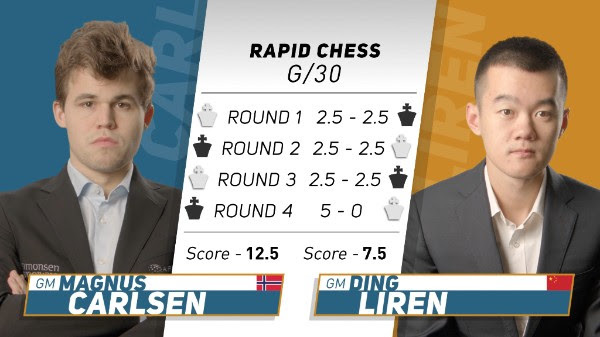 On top of these already exciting matches, two more players joined the event: Magnus Carlsen faced off in his g/30 rounds against Ding Liren. 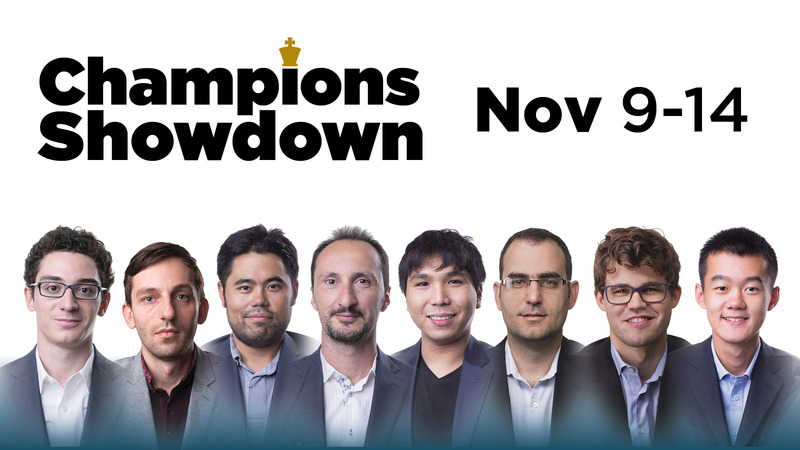 The inclusion of the World Champion is always welcome, and facing off against China's #1, and one of the players of the upcoming Candidates Tournament in March, only adds excitement to the Showdown. This was a very streaky one! Caruana was outplayed in game one, and after drawing game two, he also went down in games three and four, one of them included a big advantage blundered away by missing a simple mate in two sequence. It seemed that Grischuk was simply running away with the match, but the American wasn't done yet. The streak was broken in a surprising way: Caruana was completely against the wall, but in these fast time controls the clock plays a huge role! Caruana flagged Grischuk, and then won two nice games to remain in striking distance. In a strange series of results, the black pieces won the first four games of this match on the third day! Aggressive play prevailed throughout, with many exchange sacrifices being thrown around and Nakamura's pawns seeming to roll down the board when he wasn't getting mated! In a fabulous display of sportsmanship, Topalov, in a drawn position, offered to split the point in game five when Nakamura only had one second left, while Nakamura returned the favor soon after! 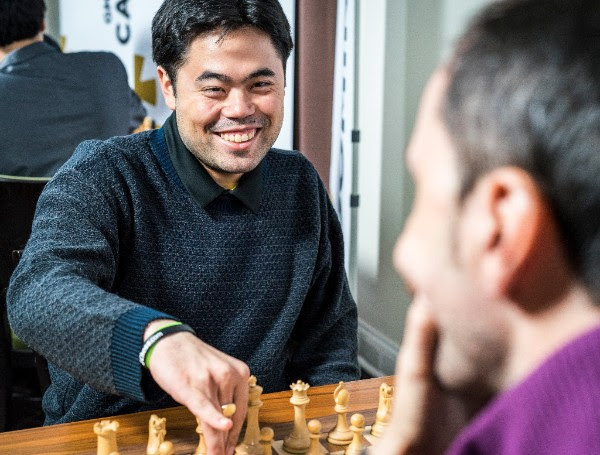 The day was split, and Nakamura continues with a huge advantage going into the blitz. 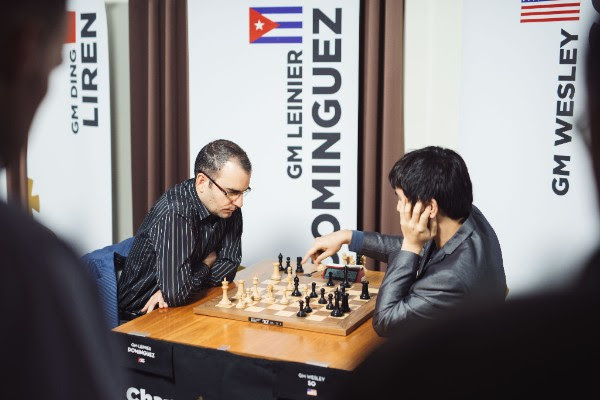 The Cuban grandmaster entered the third day with a large advantage and, even though he keeps it after day three, it certainly has decreased a bit. 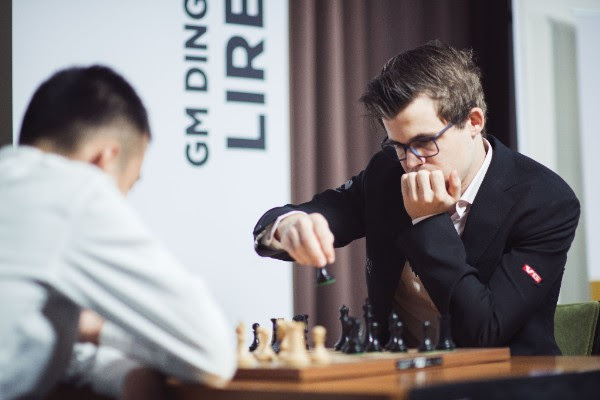 After splitting the first three games of the day, Dominguez struck first and it, like the Grischuk-Caruana match, seemed to be a one-sided affair. But just like the other match, So scored three wins in a row to finish the day and So has a realistic chance of turning the match around in the final day. When you play the World Champion, chances are that if you get one striking opportunity in a match, it might be your only one. Ding Liren had a winning position in the first game with the black pieces, but it was very far from trivial and Carlsen found a very nice trick to retain the balance. After splitting the second game, Carlsen played a fantastic sequence in game three that gave him a winning advantage, playing a razor sharp variation. However, he missed the killing blow, and Ding Liren escaped with a draw. The fourth game was the one in which Carlsen finally struck a blow. Playing with the black pieces, he put on the squeeze against his opponent and finished off with gorgeous tactics to force his pawns through. Copyright © 2017 Chess Club and Scholastic Center of Saint Louis. All rights reserved.